Personality Traits: Concrete thinking, logical, rational, organized, prompt, able to follow rules and procedures. 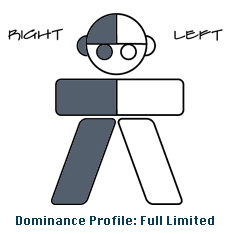 Dominance profile: Left-brain dominant, full sensory access: dominant right hand, eye, ear and leg. Note: Students who are right-brain dominant, full sensory limited (all functions right-dominant) may be at the greatest disadvantage. Excerpted and adapted from Creating Emotionally Safe Schools, by Dr. Jane Bluestein (Deerfield Beach, FL. : Health Communications, Inc, 2001). Nearly all the ‘dropouts’ of society have learning styles different from their school’s main teaching style. 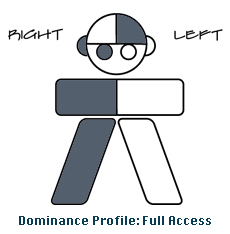 This image shows the dominance profile of a learner who is likely to be strong in verbal, visual, auditory, and kinesthetic channels. As children in traditional school settings, these individuals tend to be fairly comfortable and successful. This profile represents a large number of students who are classified as Gifted and Talented. This image shows the dominance profile of a learner who is likely to be challenged in verbal, visual, auditory, and kinesthetic channels. As children in traditional school settings, these individuals often struggle to process information the way it is typically offered. They are likely to need more time to respond when called on, which may prompt some adults to believe that they either do not know the answer or that they were not paying attention, although it is far more likely that these learners just need a little more time to process and retrieve information. This profile represents a large number of students who are classified as Special Needs (including ADHD, learning disabled, and behavior disordered) and often do well in classrooms, schools, and programs that are geared to the needs of non-traditional learners. Incidentally, modality and sensory preferences do not seem to correlate with what we call intelligence. (Albert Einstein was Full Sensory Limited.) There are numerous factors that influence how individuals learn— some hard-wired into our neurology and others (like parents getting divorced, or a threat received in the hallway) more situational. The reason I’ve included this post is to remind parents and teachers that we don’t all look the same when we are learning, and if kids aren’t getting what we are trying to teach them, let’s be willing to come at it from a different angle and let kids practice in a way that is natural for them. Special thanks to Dr. Carla Hannaford for this information, some of which is adapted from her book, The Dominance Factor: How Knowing Your Dominant Eye, Ear, Brain, Hand, & Foot Can Improve Your Learning (Marshall, NC: Great Oceans Publishers, 1997). Click here to see what people are saying about Creating Emotionally Safe Schools. Survey: Is Your School (or Classroom) an Emotionally Safe Place? As an internet site owner, I feel the topic material here is real amazing. Appreciate it for your efforts.